Ray Person sent me an article from Money Magazine that compares mean wealth with median wealth. The US is one of the wealthiest countries in the world on a per-capita (mean) basis, but we have less equally distributed wealth than most rich countries which means that the average American (the median) is poorer than most of the rich nations that we like to compare ourselves with. In the article, Edward Wolff names some interesting theories why the US has the highest wealth inequality. He points out that high college spending in the US and our unusual home ownership patterns have a big impact on median wealth and America’s weaker safety net means that random events are more likely to wipe out the savings of middle class (and below) Americans. The median American is likely to go into debt at some point to pay for a health crisis, education, or a period of unemployment. The nation with the highest median wealth in the world is Australia. It does not have a particularly expansive welfare states, but they do have universal healthcare and cheaper university education than the US. They also have some of the most expensive housing in the world which could hurt median net wealth if it was mainly financed via debt. Although housing is the most important store of wealth for the median, it is also a living expense so expensive housing usually hurts living standards. It is odd that Australia has high housing prices when it has very low population density and is a major natural resource exporter. Australia should have low materials costs for construction. I’m skeptical of Credit Suisse‘s methodology and suspect that they overstate median net wealth in the above graph. As I wrote before, median wealth makes a lot more sense than mean wealth because all financial wealth is a zero-sum game. All financial wealth, including the financial value of all money, is merely debt and so one person’s financial wealth is merely another person’s debt. On average, all financial wealth is zero, so there is no point trying to measure mean financial wealth. But because the distribution of wealth is highly skewed, median financial wealth is always negative. High financial wealth inequality can only happen by increasing the percent of the population that is in debt and decreasing median financial wealth. Population growth increases the marginal utility of physical goods. Land is an example. When the population increases, the marginal productivity of land must increase. Technological improvements increase the productivity of existing bundles of atoms. For example, the invention of the stone arch made masonry more productive. Capital formation increases the productivity of existing bundles of atoms. For example, if we build a lot of stone bridges through much hard work, it will increase wealth by making the existing stone more productive. The Pons Fabricius bridge in Rome has been in continuous use for over two millennia. That was a lasting increase in wealth. The pyramids of Egypt increased wealth longer, but they have had a much lower payoff relative to the sacrifice they required of the original builders. 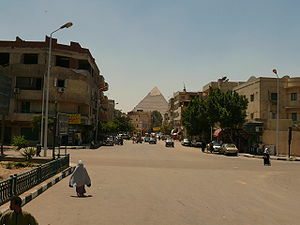 They have increased the beauty of the view at the Giza plateu. That is all I can think of. Financial innovation only increases real wealth if it has an impact on population, technology, or capital formation. Unfortunately, the wealth statistics probably confuse financial wealth with real wealth. Most people do.